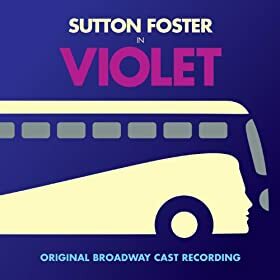 The story in Jeanine Tesori and Brian Crawley’s Violet is slight but emotionally rich: a young woman with a scar on her cheek seeks out a televangelist for literal healing and instead finds emotional healing through a combination of a compassionate young soldier and her own growing sense of empowerment. The original production never moved past Playwright’s Horizons, but did yield an Original Off-Broadway Cast Recording (on a label started by composer Jeanine Tesori ), and subsequently became a sentimental favorite for devotees of musical theater. It contains many wonderful numbers–most notably “On My Way“, “Let It Sing“, and “Lay Down Your Head”– and memorable performances by an impeachable cast (including Lauren Ward, Michael McElroy, Michael Park). The songs are presented without interrupting or introductory dialogue, which makes for a smooth listening experience but is confusing for listeners, like me, who have never seen a production. The lack of context can do the score a disservice, forcing songs that are meant to be heard as underscoring for scenes to sustain as individual tracks along side the more impressive highlights. The result is a disk that can seem uneven, and occasionally tedious. This past weekend saw the closing of a well received, if unexpected, Broadway revival which boasted an acclaimed performance from star Sutton Foster and a revised text, which was refined and trimmed it to an intermission-less 90-ish minutes (losing a song or two in the process).The Broadway cast gets a deluxe two-disk recording that seems to preserve just about the complete show. Presenting the score in context not only brings meaning and weight to individual songs, it reveals the beautiful, fluid, and delicate integration of book and score. Some may become frustrated with the frequency of spoken dialgue, but this approach is welcome for the sheer amount of additional score that is preserved, as well as the clarifying context. “Lonely Stranger” is an example of a song that disappears on the OOBCR but shines on the Broadway cast recording, where it starts strong with a dynamic performance by Anastacia McCleskey before fading to the background as a scene weaves throughout. The scene is affecting, as is the way Tesori manipulates the musical themes as they continue underneath it, so I am grateful for the opportunity to hear both. Sutton Foster is wonderful in the title role. Her trademark bright belt is well suited for Violet’s early optimism. As the character experiences difficulties and disappointments, Foster gets a chance to utilize more somber and nuanced tones than her previous Broadway performances allowed. The rest of the cast (including the always wonderful Joshua Henry and Colin Donnell) is likewise excellent, comparable (though not superior) to their predecessors on the OOBCR. The OOBCR is a contemporary classic, but it seems like may be out of print. (Amazon only has used copies, other sites don’t carry it at all, and it’s not sold in digital formats.) So in addition to preserving a revised version of the show (which one hopes will be the officially licensed version before long), providing the complete score (as well as most of the book), and featuring a very talented cast of some of the decade’s most popular and respected performers, the 2014 Broadway Cast Recording may soon bear the responsibility of being the only readily available Violet. Hawks Test Report Card: In addition to all the previously mentioned songs, the score contains several other delightful numbers: “All to Pieces“, “Surprise”, “Promise Me Violet”, “Bring Me to the Light”. Numbers I found irksome before, I can enjoy and appreciate thanks to a greater understanding of how they fit in the piece. If the new recording may make it harder to single favorite musical moments, it is much more satisfying as a whole.